This multi-part tutorial covers the creation of a new data source extension for Power Query. The tutorial is meant to be done sequentially - each lesson builds on the connector created in previous lessons, incrementally adding new capabilities to your connector. One of the powerful features of the M language is its ability to push transformation work to underlying data source(s). This capability is referred to as Query Folding (other tools/technologies also refer to similar function as Predicate Pushdown, or Query Delegation). When creating a custom connector which uses an M function with built-in query folding capabilities, such as OData.Feed or Odbc.DataSource, your connector will automatically inherit this capability for free. This tutorial will replicate the built-in query folding behavior for OData by implementing function handlers for the Table.View function. This part of the tutorial will implement some of the easier handlers to implement (i.e. the ones that don't require expression parsing and state tracking). Future tutorials will implement more advanced query folding functionality. To understand more about the query capabilities that an OData service might offer, please review the OData v4 URL Conventions. Note: As stated above, the OData.Feed function will automatically provide query folding capabilities. Since the TripPin series is treating the OData service as a regular REST API, using Web.Contents rather than OData.Feed, we need to implement the query folding handlers ourselves. For real world usage, it is recommended that you use OData.Feed whenever possible. Please see the Table.View documentation for more information about query folding in M.
The Table.View function allows a custom connector to override default transformation handlers for your data source. An implementation of Table.View will provide a function for one or more of the supported handlers. If a handler is unimplemented, or returns an error during evaluation, the M engine will fall back to its default handler. When a custom connector uses a function that does not support implicit query folding, such as Web.Contents, default transformation handlers will always be performed locally. If the REST API you are connecting to supports query parameters as part of the query, Table.View will allow you to add optimizations that allow transformation work to be pushed to the service. If you re-run the unit tests, you'll see that the behavior of your function hasn't changed. In this case your Table.View implementation is simply passing through the call to GetEntity. Since your haven't implemented any transformation handlers (yet! ), the original url parameter remains untouched. The above implementation of Table.View is simple, but not very useful. The following implementation will be used as our baseline - it doesn't implement any folding functionality, but has the scaffolding we will need to do it. // Implementation of Table.View handlers. // tracing if a handler returns an error. // the entity name that was passed into the function. // Calculates the final URL based on the current state. If you look at the call to Table.View, you'll see an additional wrapper function around the handlers record - Diagnostics.WrapHandlers. This helper function is found in the Diagnostics module (that was introduced in a previous tutorial), and provides us with a useful way to automatically trace any errors raised by individual handlers. The GetType and GetRows functions have been updated to make use of two new helper functions - CalculateSchema and CaculateUrl. Right now the implementations of those functions are fairly straightforward - you'll notice they contain parts of what was previously done by the GetEntity function. Finally, you'll notice that we're defining an internal function (View) that accepts a state parameter. As we implement more handlers, they will recursively call the internal View function, updating and passing along state as they go. Update the TripPinNavTable function once again, replacing the call to TripPin.SuperSimpleView with a call to the new TripPin.View function, and re-run the unit tests. You won't see any new functionality yet, but we now have a solid baseline for testing. Since the M engine will automatically fall back to local processing when a query can't be folded, you must take some additional steps to validate that your Table.View handlers are working correctly. The manual way to validate folding behavior is to watch the URL requests your unit tests make using a tool like Fiddler. 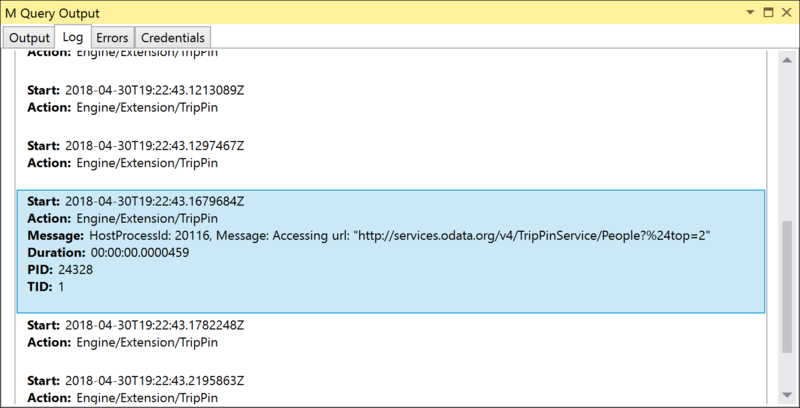 Alternatively, the diagnostic logging we added to TripPin.Feed will emit the full URL being run, which should include the OData query string parameters our handlers will add. We couldn't fold the expression to the source. Please try a simpler expression. You can test this out by adding a new Fact to your unit test file that contains one or more table transformations. The Error on Folding Failure setting is an "all or nothing" approach. If you want to test queries that aren't designed to fold as part of your unit tests, you'll need to add some conditional logic to enable/disable tests accordingly. The remaining sections of this tutorial will each add a new Table.View handler. We will be taking a Test Driven Development (TDD) approach, where we first add failing unit tests, and then implement the M code to resolve them. The OnTake handler receives a count parameter, which is the maximum number of rows to take. In OData terms, we can translate this to the $top query parameter. These tests both use Table.FirstN to filter to the result set to the first X number of rows. If you run these tests with Error on Folding Failure set to False (the default), the tests should succeed, but if you run Fiddler (or check the trace logs), you'll see that the request we send doesn't contain any OData query parameters. If you set Error on Folding Failure to True, they will fail with the "Please try a simpler expression." error. To fix this, we'll define our first Table.View handler for OnTake. The CalculateUrl function is updated to extract the Top value from the state record, and set the right parameter in the query string. Rerunning the unit tests, we can see that the URL we are accessing now contains the $top parameter. (Note that due to URL encoding, $top appears as %24top, but the OData service is smart enough to convert it automatically). The OnSkip handler is a lot like OnTake. It receives a count parameter, which is the number of rows to skip from the result set. This translates nicely to the OData $skip query parameter. // OnSkip - handles the Table.Skip transform. // The count value should be >= 0. The OnSelectColumns handler is called when the user selects or removes columns from the result set. The handler receives a list of text values, representing the column(s) to be selected. In OData terms, this operation will map to the $select query option. The advantage of folding column selection becomes apparent when you are dealing with tables with many columns. The $select operator will remove unselected columns from the result set, resulting in more efficient queries. The first two tests select different numbers of columns with Table.SelectColumns, and include a Table.FirstN call to simplify the test case. Note: if the test were to simply return the column names (using Table.ColumnNames), and not any data, the request to the OData service will never actually be sent. this is because the call to GetType will return the schema, which contains all of the info the M engine needs to calculate the result. The third test uses the MissingField.Ignore option, which tells the M engine to ignore any selected columns that don't exist in the result set. The OnSelectColumns handler does not need to worry about this option - the M engine will handle it automatically (i.e. missing columns won't be included in the columns list). Note: the other option for Table.SelectColumns, MissingField.UseNull, requires a connector to implement the OnAddColumn handler. This will be done in a subsequent lesson. CalculateUrl is updated to retrieve the list of columns from the state, and combine them (with a separator) for the $select parameter. The OnSort handler receives a list of record values. Each record contains a Name field, indicating the name of the column, and an Order field which is equal to Order.Ascending or Order.Descending. In OData terms, this operation will map to the $orderby query option. The $orderby syntax has the column name followed by asc or desc to indicate Ascending or Descending order. When sorting on multiple columns, the values are separated with a comma. Note, if the columns parameter contains more than one item, it is important to maintain the order in which they appear. // If there are multiple records, the sort order must be maintained. // where each entry is "<columnName> <asc|desc>"
orderText = if (order = Order.Ascending) then "asc" else "desc"
Unlike the other query handlers we've implemented, the GetRowCount handler will return a single value - the number of rows expected in the result set. In an M query, this would typically be the result of the Table.RowCount transform. We have a few different options on how to handle this as part of an OData query. The $count query parameter, which returns the count as a separate field in the result set. The /$count path segment, which will return only the total count, as a scalar value. 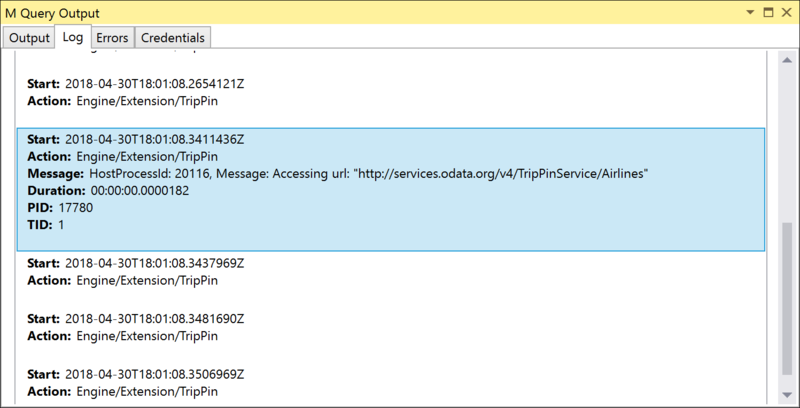 The downside to the query parameter approach is that still need to send the entire query to the OData service. Since the count comes back inline as part of the result set, we'll have to process the first page of data from the result set. While this is still more efficient then reading the entire result set and counting the rows, it's probably still more work than we want to do. The advantage of the path segment approach is that we'll only receive a single scalar value in the result. This makes the entire operation a lot more efficient. However, as described in the OData spec, the /$count path segment will return an error if you include other query parameters, such as $top or $skip, which limits its usefulness. In this tutorial, we'll implement the GetRowCount handler using the path segment approach. To avoid the errors you'd get if other query parameters are included, we will check for other state values, and return an "unimplemented error" (...) if we find any. Returning any error from a Table.View handler tells the M engine that the operation cannot be folded, and it should fallback to the default handler instead (which in this case would be counting the total number of rows). Since the /$count path segment returns a single value (in plain/text format), rather than a json result set, we'll also have to add a new internal function (TripPin.Scalar) for making the request and handling the result. // Similar to TripPin.Feed, but is expecting back a scalar value. // This function returns the value from the service as plain text. The CalculateUrl function is updated to append "/$count" to the URL if the RowCountOnly field is set in the state. // then we add /$count to the path value (following the entity name). The new Table.RowCount unit test should now pass. To test the fallback case, we'll add another test that forces the error. First, we'll add a helper method which checks result of a try operation for a folding error. // Returns true if there is a folding error, or the original record (for logging purposes) if not. Then we add a test that uses both Table.RowCount and Table.FirstN to force the error. An important note here is that this test will now return an error if Error on Folding Error is set to false, because the Table.RowCount operation will fall back to the local (default) handler. Running the tests with Error on Folding Error set to true will cause Table.RowCount to fail, and allows the test to succeed. Implementing Table.View for your connector adds a significant amount of complexity to your code. Since the M engine can process all transformations locally, adding Table.View handlers does not enable new scenarios for your users, but will result in more efficient processing (and potentially, happier users). One of the main advantages of the Table.View handlers being optional is that it allows you to incrementally add new functionality without impacting backwards compatibility for your connector. For most connectors, an important (and basic) handler to implement is OnTake (which translates to $top in OData), as it limits the amount of rows returned. The Power Query experience will always perform an OnTake of 1000 rows when displaying previews in the navigator and query editor, so your users might see significant performance improvements when working with larger data sets. In subsequent tutorials, we will look at the more advanced query handlers (such as OnSelectRows), which require translating M expressions.